Mixed precipitation expected. 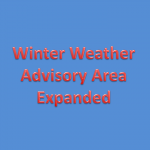 Total snow accumulations of 1 to 3 inches and ice accumulations of up to one tenth of an inch expected. 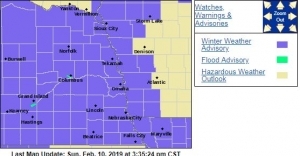 The Advisory covers portions of east central, northeast and southeast Nebraska and southwest and west central Iowa from 6 AM Monday to midnight CST Monday night. Plan on slippery road conditions. The hazardous conditions could impact the morning or evening commute.